Not even a nine-point lead late in the fourth quarter could send the Montana women’s basketball team to its first Big Sky Conference victory of the season, not with Peyton Ferris on the other side. Ferris scored 27 points, including a big 3-pointer as part of a 9-0 run at the end of regulation that sent the game to overtime, and Montana State outlasted the Lady Griz in the extra period to win 75-69 at Dahlberg Arena on Saturday afternoon. After McKenzie Johnston, who scored a season-high 17 points, put Montana up 60-51 with 2:34 left in the fourth quarter, Hannah Caudill sparked the Bobcats’ rally with a deep 3-pointer just eight seconds later. Taylor Goligoski missed a 3-pointer at the other end that could have pushed the lead back to nine and probably would have ended it. That would turn out to be the final shot of the fourth quarter for Montana, which had three turnovers and no looks at the basket in the final two minutes. Ferris hit from 3-point range on Montana State’s next possession, and Delaney Junkermier converted a three-point play with 59 seconds left to even the score at 60. A Lady Griz turnover with less than 30 seconds remaining gave Montana State the final shot, but Caudill’s runner was off the mark at the buzzer. It didn’t matter. With all the momentum on their side, the Bobcats scored the opening six points of the overtime, making their run 15-0, and never allowed the Lady Griz to make it a one-possession game as Montana State won in Missoula for just the seventh time in 52 games. It was the things that will keep a coach up at night — turnovers and missed free throws — that cost Montana the game. 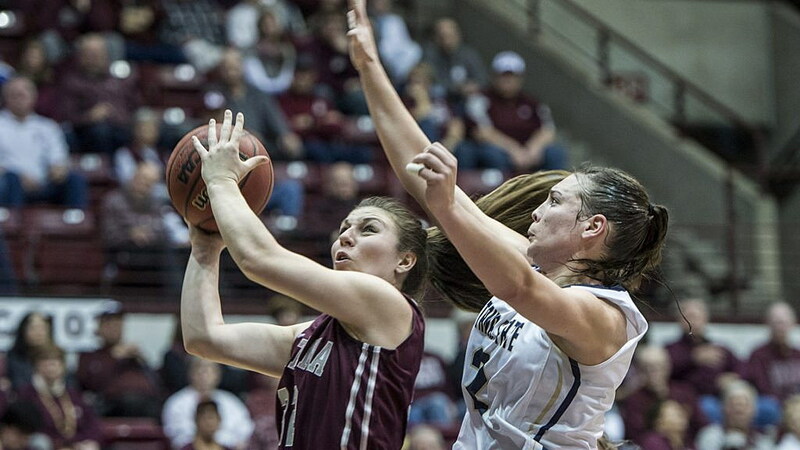 The Lady Griz turned it over 18 times and missed 11 free throws, eight in the second half and overtime. With North Dakota winning at Northern Colorado earlier on Saturday, a win was going to move Montana State (16-5, 9-2 BSC) within a game of the Big Sky’s co-leaders. The Bobcats got what they needed, but the Lady Griz didn’t make it easy. Montana State led for most of regulation but never comfortably. Up 30-27 at the half, the Bobcats could extend their lead to no more than four in the third quarter, and that set Montana up to appear to take control in the fourth. The Lady Griz hit nine of their first 12 shots in the period, and that allowed them to turn a 47-45 deficit into a 60-51 lead in just five-and-a-half minutes of inspired basketball. They went up nine on Johnston’s basket in the paint with 2:34 left. Goligoski and Johnston scored 15 of Montana’s 19 points in the fourth quarter. Maybe Montana State comes back if Caudill doesn’t answer with a three just seconds after Johnston made it 60-51, maybe the Bobcats don’t, but it was probably the biggest shot of the game for MSU. She dribbled up the court, came to a stop feet behind the arc and put an end to Montana’s surge. The Bobcats were not going to go away quietly. Junkermier tied it by finishing through contact with 59 second left. Montana State’s four starters who are upperclassmen combined to score 62 of the Bobcats’ 75 points. With the game tied at 60 after Junkermier’s and-one, Montana tried to get the ball inside to Emma Stockholm, but she couldn’t collect it cleanly, and Ferris came up with the steal. It was the third turnover in less than 70 seconds for the Lady Griz. Goligoski’s 19 points, 15 of which came after halftime, were her most since before Christmas. Johnston added 17 and Schoening finished with 11 points, a team-high eight rebounds and a pair of veteran-like hustle plays. With her teammates struggling from the free throw line, Schoening once in the first quarter and once in the third grabbed misses on perfectly timed jumps and scored on putbacks, the type of plays the season-high crowd of 3,223 fully appreciated. In addition to Ferris’s 27 points, she added a game-high 12 rebounds and five blocks. Senior teammate Riley Nordgaard added her own double-double with 12 points and 10 boards. Junkermier had 13 points, Caudill 10. Montana (3-19, 0-11 BSC) will host Southern Utah and Northern Arizona at home next week.